Streamline your workday, improve profitability, and enhance patient care with Chiropractic Advantage, a truly remarkable chiropractic healthcare software. We offer a single solution for your entire office workflow including EHR, Practice Management, inventory management, and a patient portal. Advantage is a chiropractic healthcare software that includes customizable templates to support the documentation needs of chiropractors. Our EHR learns your individual practice patterns as you chart, and automatically adapts to your style of practice. Our responsive, knowledgeable support and training team is by your side every step of the way to ensure your EHR success. 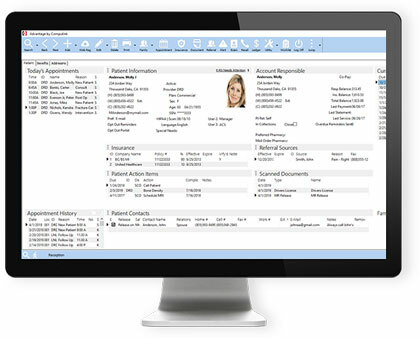 Screens, workflows, reports, standard of care plans – Advantage is a chiropractic healthcare software that lets you easily customize them all to support your exact style of practice. Our Advantage SMART Workflow® improves patient throughout by 15% or more! Advantage helps you get paid more of what your owed for your services. We even offer an Expert Billing Service to get you paid more, faster. Our powerful task automation App that automates repetitive tasks including reporting, patient communications, and staff to-do’s. In-office patient engagement to increase your bottom line!